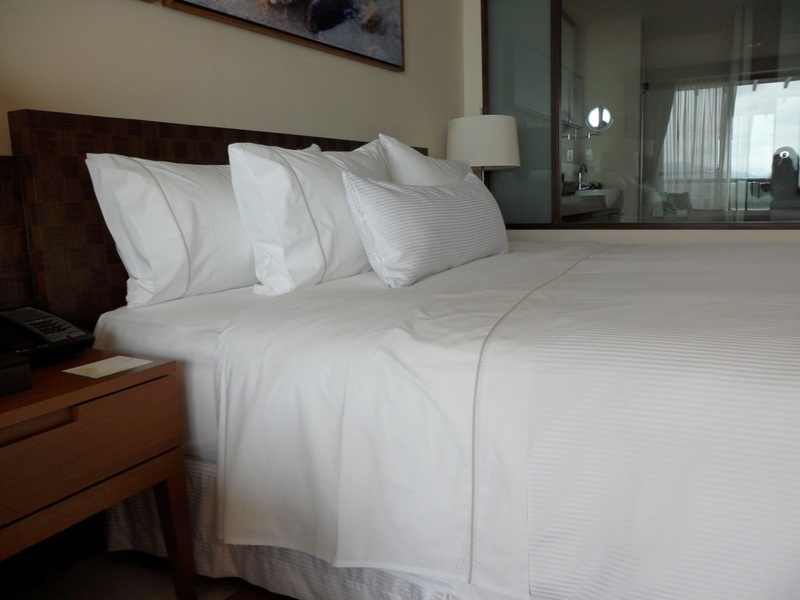 The first thing that came to my mind when hub told me we are heading to Westin Siray Bay Resort and Spa in Phuket was the Westin famed heavenly bed ! Having heard so much good reviews about this ‘heavenly’ bed, I was lusting to sink my body into it and roll around under the blanket. Yes – I am crazy, mind me. Hehehe.. the thing is, for those who know me well, I LOVE anything to do with bed. From mattress, bedsheets to pillows, I love em all. Hub thinks I am crazy when I droll over 600 thread counts Egyptian cotton bedsheets or when I sigh in bliss when I sink my head into a 100% goosedown pillow. I can’t help it – like a Shopaholic who can’t stop shopping, I guess I am a bedaholic ! Anyway, back to the Westin heavenly bed. Once we were let into our room, I hover over the bed getting ready to jump in until hubs remind me to take a nice picture of it first before messing it up so that I could put up on my blog later. Hehehe.. so, thanks to him, here’s a few pictures of how the bed look. I was a little disappointed that the bed didn’t come in the 10 layers as advertise in their website. Perhaps it was because we are in a hot tropic climate, hence, 2 layers of the blanket and deco sheet was not included. Mattresses are really subjective and I guess there no such thing as one size fits all. In this case, hub and I definitely prefer that our mattress is a little more firm and supported.